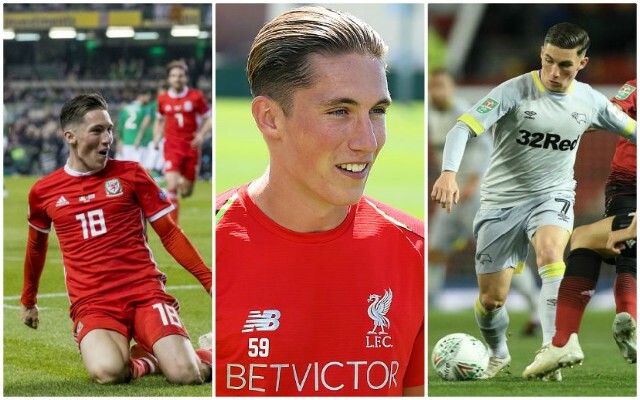 All affiliated with Liverpool Football Club will have taken great pleasure in failing to contain a ‘told you so’ smirk at the sight of Harry Wilson burying the Mancs. That smirk will have broadened significantly in light of his similar heroics for Wales during Tuesday’s win over the Republic of Ireland. Reds that monitored his progress through the youth ranks have been well accustomed to the ingenuity stored inside that left boot and the damage it would inflict once unleashed. To silence Old Trafford in such jaw-dropping fashion on the way towards knocking out United was the first major reward for his persistence in recent years. To flex his set-piece prowess again just a matter of weeks later was a warning that he is no fluke. One of Liverpool’s best kept-secrets is finally being unmasked. The Welshman has been long overdue a place in the back-page headlines, the sight of his name plastered across social media and recognised success on the senior stage. His route to first-team football has been the epitome of the adversity so many young prospects must endure, and the frustration of new hurdles having worked tirelessly to surpass the last. Whether his future lies with Liverpool or not, there is a pervasive and genuine excitement among Reds to see where he winds up. Milking his night at Old Trafford or his winner in the absence of Gareth Bale doesn’t, for now, mean previewing a certified rise to Premier League stardom, but instead lauding the kind of momentous ‘break’ he has warranted. There’s all the more reason to do so when a magical night at Old Trafford is followed by a 1-0 defeat away to Bolton Wanderers. In no disrespect to Bolton, it marked the kind of fixture that typified the back and forth nature of a young talent’s development. Wilson has earned the feeling of euphoria that two free-kicks will have generated. It’s easy to see why when considering a stop-start development in which he has witnessed youth teammates make their senior breakthroughs ahead of him. Expectations of a meteoric rise after becoming the youngest player ever to represent Wales at the age of 16 back in 2013 somewhat jumped the gun. Success with Liverpool’s U16s and U18s either side of his international bow earned Wilson a first professional contract in 2014. By this point, he was becoming a familiar face amid a period where a large proportion of the club’s youngsters were being tipped for first-team futures. Wilson launched his first pursuit of senior football in summer 2015, joining then-League One side Crewe Alexandra in what was a deemed an ideal opportunity to adapt to the physicality of English football. He managed just seven appearances, only three of which were starts, before being recalled by Liverpool at the beginning of December. A further five months on the sidelines with a broken toe set him back even further as he bid to impress Jurgen Klopp in his first season in charge. In truth, the timing of his spell out of action could not have been worse. Two steps forward became a crushing one in reverse. Given the way so many of Liverpool’s ’future stars’ fizzled out at the time, Wilson’s resilience in shrugging off such a ruthless transition from monumental high to harsh reality check is a feat worthy of his Old Trafford incentive. Having been handed a new contract extension in July 2016 and named U23s captain shortly after, he was later forced to watch as Trent Alexander-Arnold, Ben Woodburn and Ovie Ejaria made their senior debuts in the League Cup. That could and probably should have been him. His subsequent response didn’t just demand a protruding influence on the pitch, but an impeccable attitude to match. He supplied both. “I wanted to come back strong this season and play as many games as I could, stay fit and show everyone what I can do,” he told Liverpoolfc.com. Wilson was finally granted his senior debut in a January 2017, playing 25 minutes in an FA Cup third round tie against Plymouth Argyle. He failed to make another appearance after that, with his omission beginning to puzzle. The point of a brief history lesson isn’t to criticise the lack of opportunities, but to gloss the revival behind-the-scenes in light of the lack of opportunities. As far as reactions go, reaching 28 goals and double figures in assists across all formats in 2016/2017 was rather difficult to ignore. Whilst fans had been keeping a watchful eye on the likes of Woodburn and Alexander-Arnold, Michael Beale’s skipper was often shifting the spotlight onto himself. Bring on summer. Bring on more setback. Wilson’s hopes of proving himself during a pre-season with Klopp’s men were cruelly dashed by injury. Another season with the 23s beckoned, and yet he still refused to be ignored. 10 goals in 12 appearances to begin the campaign later and there was little more left for him to gain from playing youth football. A subsequent seven goals and four assists in 14 appearances on loan at Hull City over the second half of last season proved the return of a senior player. It was an eruption of the burning will to shine that had been brewing over such a long wait for his step up. At long last, he was finally given a chance to feature in a pre-season for the Reds upon his return to Melwood in the summer. By half-time of the opening game against Tranmere, he had already bagged a brace. It may still be early in his career, but he has issued a response to every challenge to come his way so far. A spell with Hull marked a mere teaser. He has since vindicated his senior pedigree with two viral additions to his showreel. The 21-year-old is thriving on both a refreshing desire to play weekly football and a steely determination to make his mark at Anfield further down the line. “It is always important to play week in, week out. You feel fit, you hit a rhythm and you feel strong,” he told the Independent following the win with Wales. There’s a ravenous instinct for goals and a technician’s delicacy to his game you suspect a manager like Klopp would love to try and polish in aim of bolstering his attacking arsenal. Mix in the intensity and work rate cultivated in a Klopp-driven youth system and there’s every chance Wilson gets multiple auditions for a long-term spot on Merseyside. Waxing lyrical over two free-kicks isn’t about perceiving them as the start of a remarkable upward trajectory, even if they do prove to be exactly that. It’s about appreciating them as a timely reminder that battling to overcome the minor setbacks was worth it – and could be worth even more. Look after him for us, Derby. For more LFC news & views, follow me on Twitter @CameronHogwood.